Graduations are a huge milestone. Whether your child is graduating from kindergarten, high school, or completing their 3rd master’s degree, family and friends will be excited to share in this achievement. 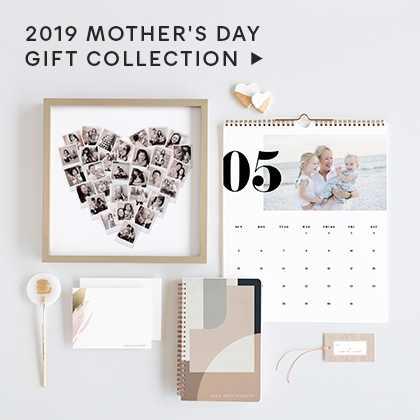 Minted is honored to be a part of this special moment by offering the best graduation announcements and invitations in a range of styles and options to match every taste. It is nice to recognize the sweetness of this moment by reflecting a moment and doing something special. We recommend you think about the graduate’s personality and story as you peruse graduation templates – we are sure that you will quickly find a number that match perfectly. Our top two words of guidance: Be Unique. Graduation announcement cards don’t have to be tied to the decorum of the school’s colors and emblems necessarily – consider doing something fun, stylish, and creative and make more of a personal statement. The same can be said for your graduation announcement wording. While it is important to include key information, (your name, school, graduation date, and graduation year) you can make it fun by adding wording that reflects your own personality. Including a favorite poem or quote is a great way to personalize your announcement. Graduation announcements can also serve double duty as graduation invitations to the ceremony itself. 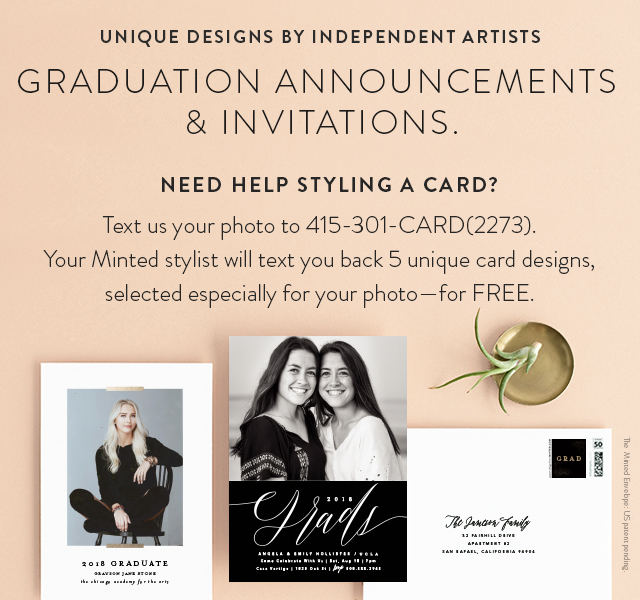 If you are specifically inviting guests to a personal celebration and want to send a party invitation only or separately, Minted also has specifically designed beautiful graduation party invitations here. Once you've found the perfect graduation invitation, be sure to take advantage of our free matching recipient address envelope printing service by uploading your list of people and addresses. Sending grad announcements to those who are unable to attend the ceremony can give a nice sense of inclusion in the achievement. And whether your recipients attended or not, our announcements are of exceptional quality and can be kept as a keepsake too. 1. Show off the tassel, the high school senior pictures or both. Customizing your high school graduation announcements with a photo turns your card into a keepsake. 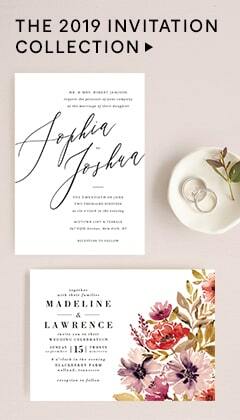 If you prefer an announcement without a photo, Minted has dozens of stunning designs that will equally impress. 2. Try to include key information on the front of your card. It is fun to customize a graduation announcement, but there are a few important pieces of information recipients will be expecting to see in your announcement, and you will want to put these in a place where they will read it. Always include: · your full name, · the name of the school or program from which you are graduating, and · the year of the graduation and the date of the graduation. 3. Graduation announcements are a great place to share a favorite quote or poem, or even thank those that helped you achieve this milestone. Since key info is often on the front of the card, these details can help fill out the back of the graduation card but it doesn’t have to be this way. Look at the design and use your judgment. 4. Use recipient addressing services. Minted's complimentary envelope addressing and design that matches the announcement will give you an announcement that's fun to open. 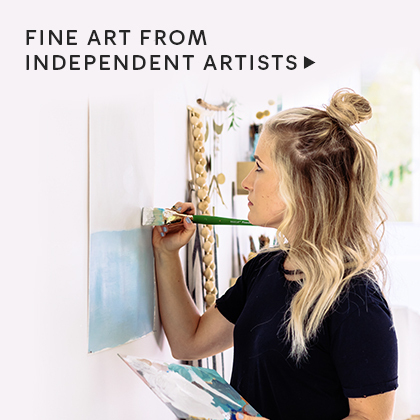 Minted’s custom graduation announcements and the matching envelopes, all designed by independent artists, lend an artistic flair to celebrate this milestone for your graduate. 5. Consider creating custom stamps to elevate your graduation announcement or graduation invitation cards. 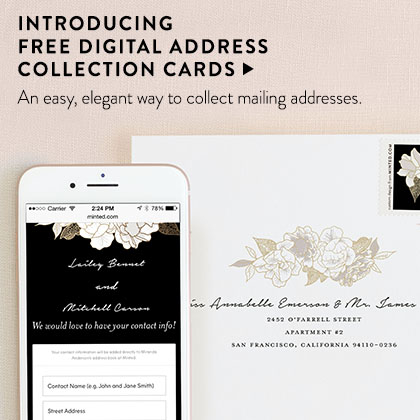 A custom stamp alongside Minted’s FREE recipient addressing will make your announcement a standout. 6. If you are planning to invite guests to celebrate the occasion, make an all in one graduation invitations and announcement! Simply invite your intended guests, and share the details as a part of your announcement. 7. Give gifting options. If you prefer not to receive any, it’s okay to say "please, no gifts" on your graduation announcement cards!